So Kroger's really been pushing the new release (in their stores) of Muller yogurt recently and I'm guessing that there's a reason. Being that Muller is a Quaker product, I'm guessing Quaker is giving them a bit of a discount on their plethora of normal Quaker products so that they'll clear some shelf space in the refrigerator case for these Muller products so that they can get the public hooked on them. Not a bad business strategy for both Kroger and Muller and if that's what they are doing, then I admire it. If not, what the heck are they thinking by not doing it?! 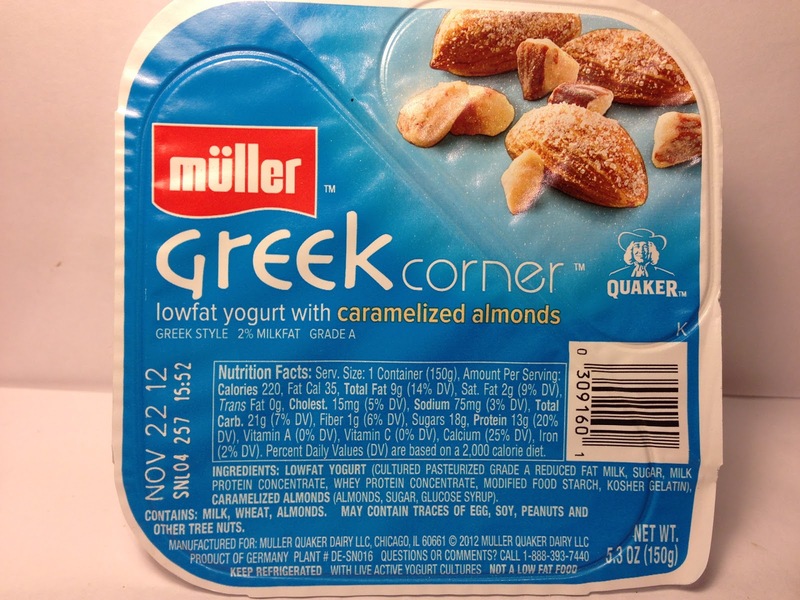 So, that increased focus has led me to continue to review these Muller products and that leads me to this Muller Greek Corner Lowfat Yogurt with Caramelized Almonds. It's the Greek version of the normal Corner line of yogurts. As with the rest of these that I purchased, it for $1.00 and it's 5.3 ounces. It also consists of 220 calories and thirteen grams of protein. I won't spend a lot of time on it, but this is the typical Corner design with the two ingredients compartmentalized so that you can choose your own adventure on how you'd like to eat it. I'm lazy, so I just dumped everything in together. Before I did that though, I did taste individually and as I've written about before, the Greek yogurt was just plain Greek yogurt with a slightly tart smell It wasn't particularly thick, but at least it wasn't watery and that is a good thing. The almonds were not what I expected though. Based on the outer packaging of the container, I expected large sized almonds and I was really looking forward to that because I thought it might be fun. What I got instead was a smattering of bits of almond pieces like you see in the picture above. Visually, I was quite disappointed, but if they could make up with that in flavor, it would be okay. Outside of the size of the almonds, my other observation was that they smelled of that candied almond taste in that they had that burnt/roasted nut smell with also the smell of roasted (caramelized obviously) sugar. It wasn't a powerful smell, but it was detectable. One thing about these bits was that it just didn't seem like there were that many of them when I looked at it and that made me sad thinking about the level of disappointment that could be coming with this one. I tasted this first individually and the Greek yogurt itself was pretty standard stuff. It did have some tang, but not much. The thickness of the yogurt made it moderately creamy too, not that it had any impact on the flavor. The real concern with this is the taste of the almonds and when I sampled them individually, I wasn't particularly impressed. They did have that nutty taste with a faint hint of sweetness, but I guess I was expecting a little more based on my prior experience eating candied nuts. 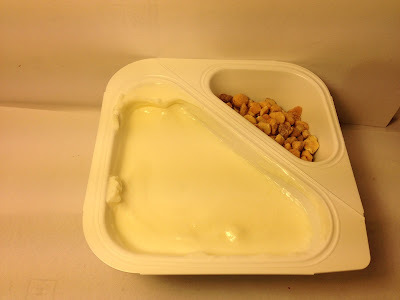 Putting that disappointment aside, I mixed the nuts into the yogurt, my visual interpretation of the number of nuts was 100% inaccurate, because once I mixed the two compartments together into the yogurt compartment, it was almost overflowing. This was a more than pleasant surprise and turned my frown that I had so far upside down. Once I took my first spoonful, that disappointment returned as what I got was a spoonful of what I thought was boring-ness as the yogurt lost its tang and the nuts lost their caramelized taste. I let that disappointment linger for a moment and then much to my surprise, I was hit by the roasted nutty flavor and also the sweetness of the caramelization, mixed with a hint of saltiness and that was great. I took spoonful number two and was given the same kind of experience, so this is a product that bores you at the front end, but excites you at the back end. Strange way for a flavor to behave, but it works in this instance. Buy It or Fly By It? With the beginning of each spoonful, I was ready to say that this was just too boring and give it a negative rating, but by the end of each spoonful, I was anxious for more each time and give it a BUY IT rating. And as I write this review, I'm starting to crave it more and more as I rehash my experience of eating it. If you can make a product that has people thinking about wanting more after the fact, you've probably got a winner and that's the case here. It's not an awesome winner, but it is a winner nonetheless. I bought a variety pack at Sam's Club mainly because of the price and the fact that carmalized almonds and fruit were seperate and not mixed in....I want to be able to add as I go depending on the taste or the want of less sugar. I LOVE IT! I give it a real thumbs UP! I love the almond variety. This product is awesome - I tried the Sam's Club variety pack. I loved all the flavors.